Power lines are no joke. Electric shocks can severely injure or even kill. For that reason, basic minimum distances have been established nationwide. In Washington State, there must be at least 20 feet of clearance when a power line is energized. If very high voltage wires are present (more than 350 kV), that distance grows to 50 feet. This includes at the job site as well as transportation to the job site, where low-hanging energized power lines can wreak havoc with route plans. The importance of a solid route plan cannot be overstated here. So what steps can be taken? Reviewing the job site before work begins is obviously a must. At this point, the crew can measure how much clearance is available throughout the entire operation. From there, the decision can be made for delivery of cranes and how the cranes will be assembled and disassembled. If possible, initiate contact with a power company to find out what kind of power lines you will be dealing with. If feasible, the utility may be able to de-energize or even relocate power lines for a period of time. However, if this will cause undue hardship on residential or business customers, moving the power lines might not be an option. At this time, warning guides can be determined to give the operator visible cues to clearances. These could be elevated warning lines, barricades, or even a line painted on the ground. An experienced, dedicated spotter must also be used when power lines are present. There must always be an open line of communication between the crane operator and spotter. Even with days of planning, unforeseen circumstances could put the crane, operator, and ground crew in grave danger. This could be something as simple as an unexpected wind gust blowing the load dangerously close to a power line all the way up to gross negligence. In either case, knowing what to do in case of contact with power lines could save your life. If a crane does come in contact with a power line, remember that the crane, as well as the ground around it, will become energized. Without getting too technical, the human body can withstand contact with consistent voltage. By taking your one foot off the ground, the voltage level will change between the two feet, causing a current. This current is what can cause serious injury. The crane, load, and even the ground all conduct electricity differently and that’s what makes it so dangerous. 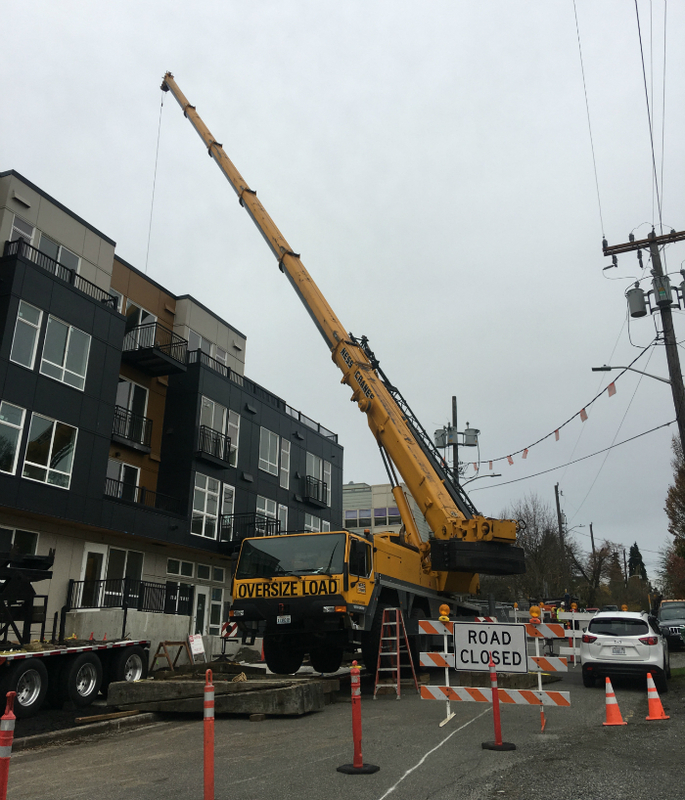 So while the crane operator may be completely safe, anyone on the ground touching the crane will experience different (and deadly) levels voltage at the same time. If there is contact and the ground becomes energized, don’t move! Keep your feet close together and arms to your side. If you must leave the area, shuffle along the ground, keeping your feet as close together as possible. The crane operator should immediately reverse course to break contact with the line. This why a dedicated spotter is so important - the operator may not even be aware contact was made! Once contact is broken, keep an eye on the line as it could have been damaged or weakened during the event. Have someone outside of the energized area call 911 and, once it has been established the area is no longer energized, seek medical care. NessCampbell prides itself on our safety record but understands that accidents happen. We have a full-time Safety Department and our crews are well-trained in safety procedures. If your job site needs a crane, give us call. We take all safety precautions seriously and will keep your work site safe for operators, ground crews, and the public at large.